Community Emergency Response Team (or CERT)! The Greater Tehachapi Valley CERT serves Bear Valley, Alpine Forest, Golden Hills, City of Tehachapi, Old West Ranch, and Sand Canyon. Each of these areas have active CERT Units and are always looking for more people like you. This website functions as a community resource and information site for the Tehachapi CERT program which is sponsored by the Kern County Fire Dept. With our partnership with KCFD we are committed to helping prepare the community of Tehachapi in the event of a disaster. 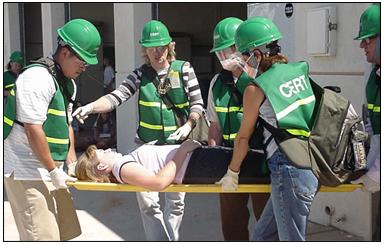 Additional information on the National "CERT" program may be found on the Citizen Corps' CERT website located at: http://www.citizencorps.gov/cert/.